[source] please note I could not find any copyright for this photo as I took it from the Facebook page in the link. If you don't care about your history, you have no future and our history is now a pile of rubble thanks to our simpletons who listen to Saudi clerics as they are now 'free' to do so! May God forgive us Libyans for burning our ancient libraries, desecrating our dead and razing our sanctuaries and mosques. If we have been able to do it then no one should be blaming anyone for 'offending' Islam. I'm beginning to wonder if we may have deserved Gaddafi for all our sins... His death may have been deliverance for him from our evil? His death has unleashed the sleeping virus. ( I won't say dragon as dragon is a noble creature). Today as some of the pillars of Libyan identity are being extinguished one by one the feeling of helplessness cannot be described. The dark ages are upon us. I am so sorry my country contributed to the demise and chaos you're facing right now. 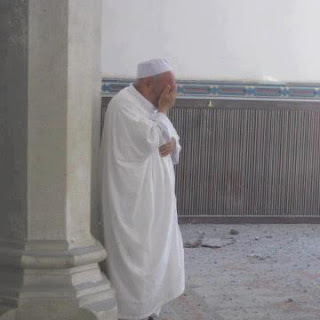 I'm ashamed of our leaders and their actions against the peaceful and sovereign country of Libya. We're not even a NATO member but we "helped" the terrorists with world class surveillance from the air. Please don't hate us Swedes. There are thousands of people here who disagreed with what happened to the Libyan Arab Jamahiriya. Many of us even tried to prosecute our own government for war crimes, but to no avail. I'm so sorry. I am sorry for these man-made disasters in Libya. Please do not think, however, that this world is just and Libyans could in any way deserve Gaddafi because of sins a small minority of them would commit long after the fact. With his regime preventing - maybe even reversing - productive development in Libya for decades, terrorizing people into submission and selecting against the best, it is small wonder that the nation isn't in its best shape now. I remember that in Iraq, the first thing some citizens did after being rid of Saddam Hussein was to loot their country's heritage (though they preferred to steal and presumably sell, rather than to destroy). Try to keep high spirit in these hard times. Faramir, there is no shame we don't hate the Swedes. Most Libyans are actually happy that NATO helped get rid of Gaddafi even though this has unleashed other problems which we have to learn to resolve and even though we understand the geopolitical causes of this intervention and accept it. Democracy is not easy really. Freedom for whom in Libya?